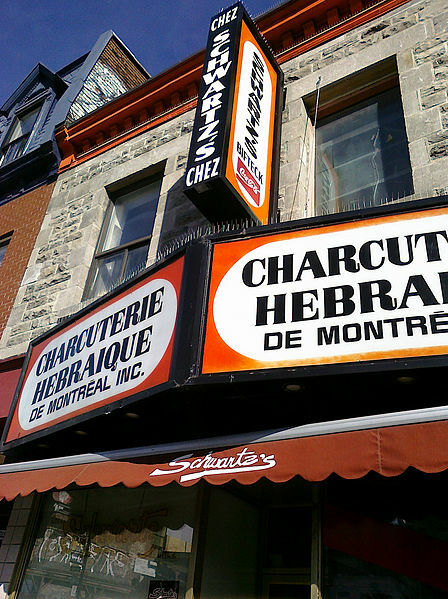 The sky didn’t fall, the earth didn’t stop turning, and most importantly, the smoked meat didn’t stop coming from the cramped galley at Schwartz’s, the legendary Montreal deli that was sold yesterday to a group of investors including Mr. and Mrs. Celine Dion. Everyone wants to get in with the Jews. Love us or hate us, you can’t stop talking about us. Imagine my surprise when I woke up and read that Celine Dion invested in Montreal Jewry. Unlike Madonna, Celine didn’t need to convert to Kabbalah to get my attention. Nor did she need to marry in or sneak her way into the fame, fortune and power that our people provide. Nay, like any modern spoiled child, she bought her way into the most coveted club in the world. And all she had to do was spend $10 million to own part of Montreal’s Ark of the Covenant. With this bold power play Celine has replaced Madonna as my singer-songwriter cougar crush. Celine is 43-years-old, with only two kids under her belt. Sure she’s into older men, but I have a theory the attraction will swing both ways. Since I assume this is a proposal, yes Celine, a new day has come, I surrender. I’ll be your new Mr. Celine Dion. (It’s all coming back to you now, isn’t it?) Together we can rule Canada! Too bad Schwartz’s Montreal smoked meat is not kosher, only kosher style. Very pompus and pretentious intro, my friend. It is partly a business move accompanied by a desire to preserve a famous Montreal institution. Not a conversion , sorry to disapoint you. A good-will gesture with loose change. But answer this: why did no-one from the jewish community rescue this monument?? Strange…no?? My theory is that since the mandatory implementation of a tax perception module to cash registers, this, as well as many other restaurants are changing hands and are the object of all sorts of scheems to desquise past doubious revenues. Cant cheat…not worth it? “With this bold power play Madonna or Celine Replaced my encounters singer-songwriter cougar crush.”? ?